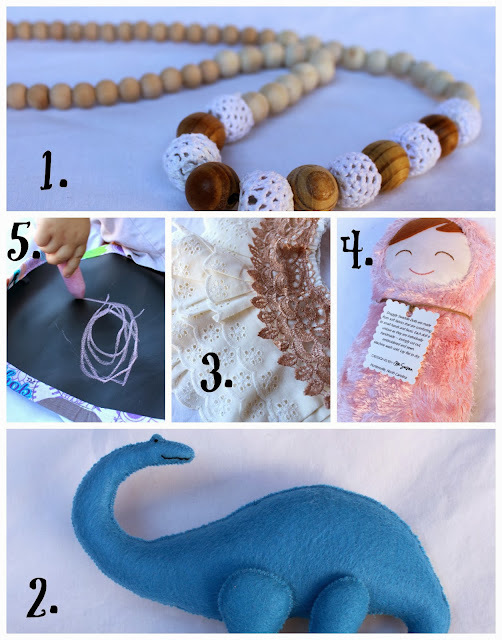 Welcome to the 2013 Handmade Holiday Gift Guide! I am thrilled to introduce you to these amazing Etsy shops so that you can find one of a kind gifts for all your favorite people. With over one million sellers on Etsy, it can be difficult to find exactly what you are looking for and be assured of the quality. This giveaway is hosted by Bare Feet on the Dashboard who handpicked 15 shops to feature in this gift guide and reviewed items from each shop so you will know you are getting the best. Check out the shops below, click over to the full reviews, and be sure to enter the big giveaway below. Give handmade this Christmas and make sure your loved ones have a gift like no one else. Please keep in mind that you will need to order by early December for personalized items and some artisans may have earlier deadlines. Learn more about our participating shops below. Alphabet Soup is a lovely shop based in Ontario run by Tammy and Vanessa and specializing in handmade wooden and crocheted nursing/teething necklaces and soother/pacifier clips. Check out the full review here. Alphabet Soup is giving away a $15 shop credit. Head to Tuscany Creative for the best in felt handmade toys and Christmas tree ornaments. Read the full review here. BFOTDB is in love with the felt farm set, tool set, woodland animal ornaments, and nativity set. You will want to buy everything in this shop. Tuscany Creative is giving away a $10 shop credit. At Tasteful Tikes shoppers will find gorgeous baby girl clothes created from vintage linens. The craftsmanship is exquisite and the designs are inventive. Read the full review of a vintage eyelet lace skirt here. This precious skirt is priced at only $15. Tasteful Tikes is giving away a $25 shop credit. Snuggly Swaddle Dolls are the perfect gift for baby's first Christmas. Etsy shop Designs by MSusan features these beautiful loveys inspired by Russian nesting dolls. You can customize the hair color and swaddle fabric, and find matching sets for siblings, as well as boy and gender neutral options. Read the full review here. Designs by MSusan is giving away a $25 shop credit. If you are looking for handmade stocking stuffers under $10, Peace Love and Baby Shop is the place. From travel play mats to one of a kind bibs to delightful felt food, all the small folks on your list are covered. BFOTDB reviewed a travel chalkboard mat priced at $7, and would highly recommend it as a gift for any kid from 2 and up. Read the full review here. Peace Love and Baby Shop is giving away a $10 shop credit. Tiny plush friends are ready and waiting to jump in to the stocking of child in your life this Christmas at Tiny Taylor's Creations. These unique embroidered toys are so detailed and perfect for kids and collectors of all ages. The four sweet plushies reviewed were of the highest quality and loved by all. Read the full review here. As well as handmade toys inspired by popular characters, Robyn also creates custom works. 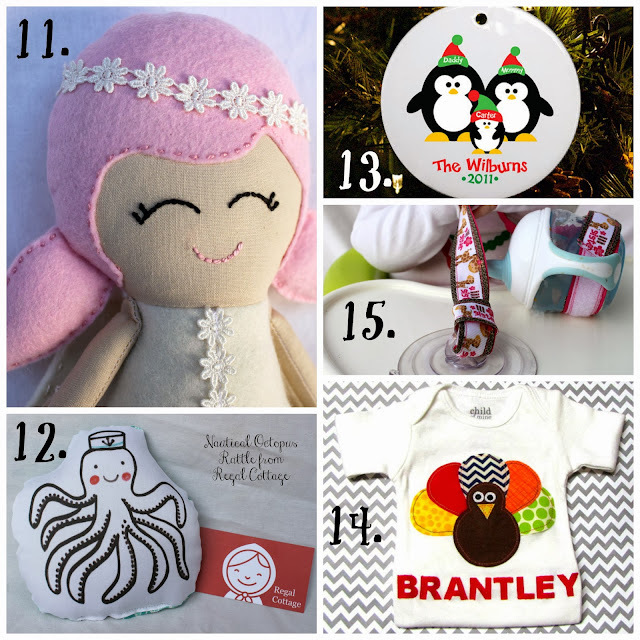 Tiny Taylor's Creations is giving away a $20 shop credit. Visit Sugar Plum Lane Baby to find the perfect gift for any stylish baby, toddler, or kid in your life. She specializes in gorgeous leggings and snuggly blankets in creative patterns. Click here for the full review. Sugar Plum Lane Baby is giving away a $50 shop credit. Do you need a thoughtful, personal gift right now? Check out Printable Wisdom for gifts you can download immediately after purchase to print and give instantly. Read the full review here. Printable Wisdom is giving away a $25 shop credit. Handmade gifts for men are notoriously hard to find, but Stamped with Hope has you covered with gifts for the fishermen and golfers in your life. With three shops available, find a gift for anyone on your list. All proceeds go towards the establishment of Hope Ranch in Missouri for children with special emotional and developmental needs. Read the full review here. Use the coupon code HOPERANCH1 for a 10% discount at all three shops. Baby onesies with flair and personalized canvas art are among the gift options offered at uniqueannick. Find gifts for baby girls, boys, and gender neutral options, as well as for your friends who love handmade decorative options. Read the full review here. Uniqueannick is giving away a $20 shop credit. A handmade, personalized doll is one of the most special gifts you can give to a little girl. At Oakleigh Park you will find not only beautiful one of a kind angels for your little angel, but also girls' accessories, tutus, flower girl dresses, baby barefoot shoes, quilts, and so much more. Read the full review of Oakleigh Park's Personalized Adorable Angel Dolls here. Oakleigh Park is giving away a $25 shop credit. If you are searching for a baby gift, Regal Cottage is the perfect stop. The shop has really precious rattles and balls just perfect tiny hands, with lots of great boy and gender neutral options. Read the full review here. Regal Cottage is giving away a $15 shop credit. Personalized ornaments, bibs, onesies, t-shirts, and family shirt sets can all be found at a one stop shop. Visit Heather Rogers Designs for custom gifts for everyone on your list. Read the full review here. Heather Rogers Designs is giving away an ornament valued at $16. Looking for a personalized onesie for a special wee one? 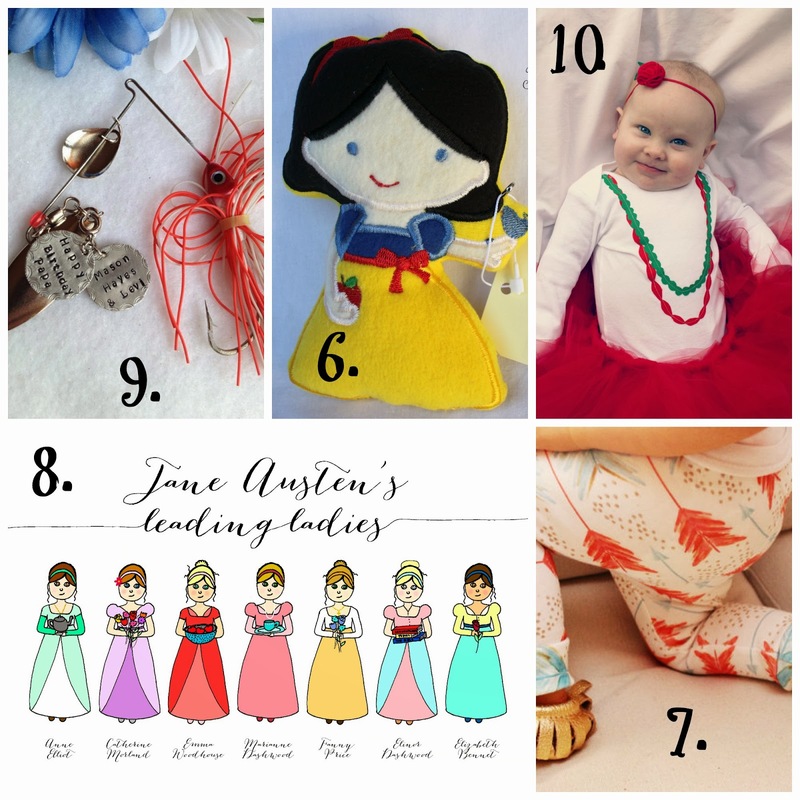 Check out the designs at Baby Simply Stated. Read the full review here. Baby Simply Stated is giving away a $20 shop credit. Visit Lil Things by Aimee for perfect stocking stuffers for moms and babies on your list teething/nursing necklaces, sippie cup leashes, and much more. Read the full review here. Lil Things by Aimee is giving away a holiday sippie cup leash valued at $10. Be sure to head over to Bare Feet on the Dashboard to see the full gift guide and in depth reviews of products from each shop. Enter the giveaway using the Rafflecopter form below. You don't have to be a blogger or have a Facebook page to enter, just an email address. This giveaway will end at midnight on November 23rd and is open worldwide. 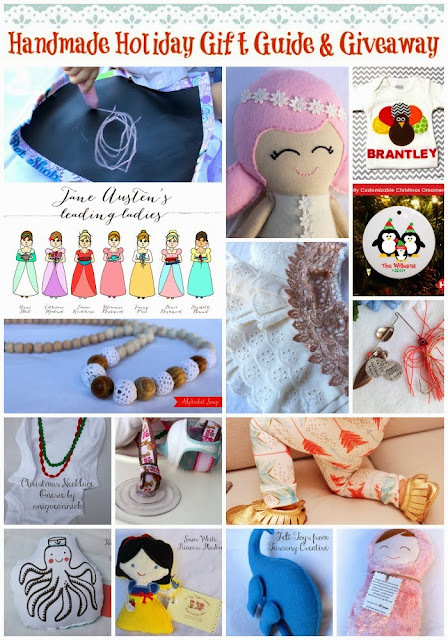 Bare Feet on the Dashboard and all Handmade Holiday Gift Guide and Giveaway participating bloggers are not responsible for prize fulfillment.